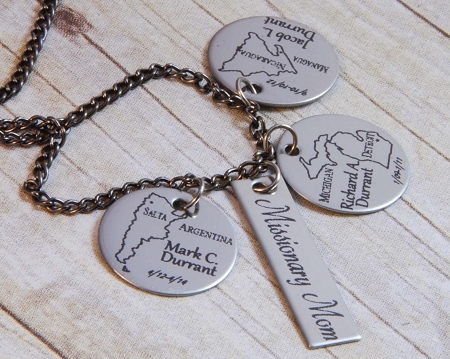 Missionary Mom Brag Necklace with One MIssionary Name Dates and Country. 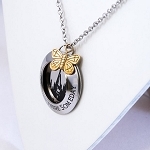 I love wearing my missionary mom necklace! I currently have 2 missionaries out, one in Argentina and one in Singapore. I have 2 return missionaries also. Then one boy left who can leave next year. This idea came about from doing the missionary plaques that hang in our church building. I wanted something that I could wear and show off. So it has the missionaries name, the dates of service, and the location in map form on the 7/8 inch circles. Comes with 18-20" chain. 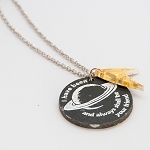 If you would like an extension to increase the length please convo me and I will set you up a listing for 25 cents an inch.What we need from you:Enter the following in the comment field during checkout (Message to Seller box)1. Name of the missionary exactly how you want it on the circle.2. Dates of Service.3. Location of the Mission so I can create a map.4. 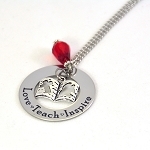 The words you want on the rectangle if different than "missionary mom".Looking for that special gift for someone? 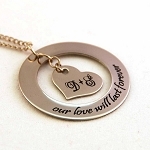 Our personalized jewelry are laser engraved pieces customized by you.Our jewelry is perfect for:Every occasion and every life eventEveryone, including yourselfCaren's Laser Guarantee:ƒ?› Excellent customer serviceƒ?› Superb quality and craftsmanshipƒ?› Unique personalized jewelryƒ?› Beautiful packaging for easy gift givingPLEASE NOTE: Our personalized custom charms, bracelets and necklaces are specialty lasered. 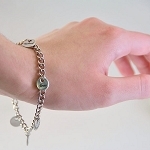 Thus, each piece will be unique and you should expect variations from the photos. No two pieces will be alike. The photo is just an example.